We have learned that M&B news we planned to share with each of you personally via letters we mailed out early this week has leaked onto social media. 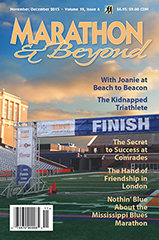 Yes, it is true that the November/ December issue of M&B will be our last. Over the past few years, our subscriber base has been getting smaller, to the point where it is no longer large enough to sustain the publication. We are sorry some of you learned the news in this fashion, if you haven’t received our letter yet. Your personal letter will provide details on how we plan to handle fulfillment for subscriptions. We have truly appreciated your support of the magazine, and we respect your commitment to it through your subscription. 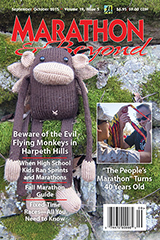 You can read more about the history of M&B in Rich Benyo’s editorial which we have chosen as our “Editor’s Choice” article for our last issue. Click here to read the entire article. 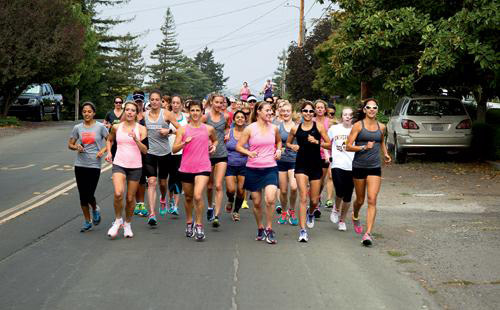 2014 was the inaugural year for Kara Goucher’s Podium Retreat, a weekend of running and wellness for women. The retreat included everything from guest speakers on running and nutrition to group runs and fitness as well as plenty of time with Kara herself. Kara spoke with M&B about last year’s experience, and the impact it had on her and other participants. How did you brainstorm the idea for your first retreat last year? The idea started a few years earlier when I began to think about what I might want to do when my racing career was over. I knew I wanted to stay involved in the sport in a way that was fulfilling to me. After running in the London Olympics, my friend, Tracey Katona, invited me to be her guest at Canyon Ranch while she taught dance week. I was blown away by what a supportive and safe environment it was for the women. There were first-time dancers and people who had danced their whole lives, but they all supported each other and helped one another grow as individuals. I thought there was a place for that in running – women inspiring and empowering each other and sharing a love of running. How does connecting with other women runners motivate you, and what can participants gain from this experience? This was a very moving experience for me last year. The women that attended the retreat filled my soul. 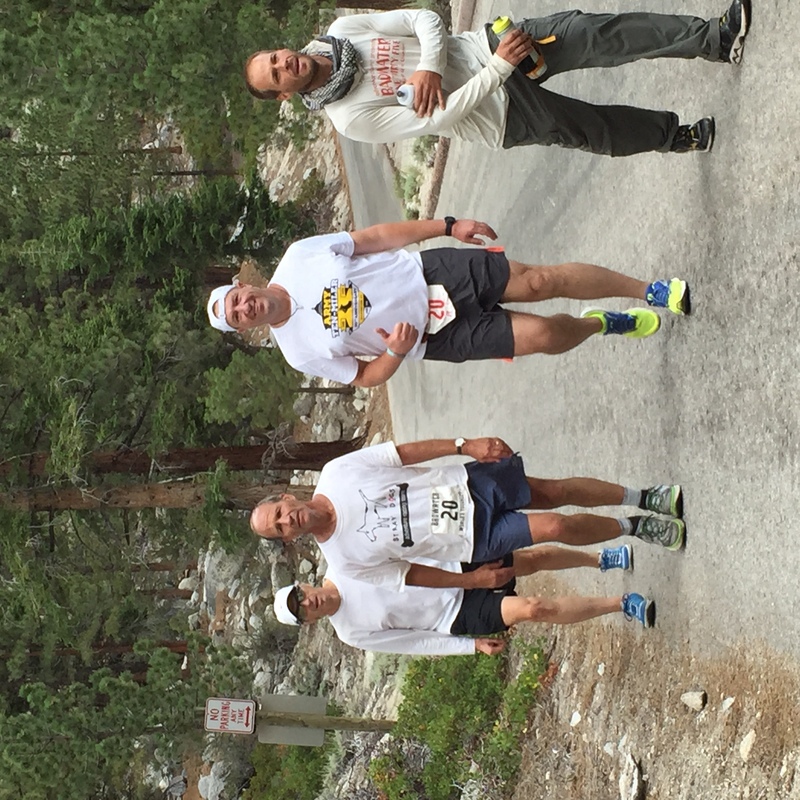 It reminded me of why I run – the pure joy of it and the friendships it has given me. I felt refreshed and motivated to see what I could get out of the rest of my career. I would say it was an emotional experience for most of the women who attended. We shared personal stories, and we grew together. We learned a lot and had a ton of fun, but we also looked into our hearts and focused in on ourselves. It was incredible, and I’m really looking forward to it again. Who have been the biggest influences in your running career? The biggest influences in my running career have always been my teammates or training partners. They are the ones who have gotten me through the hard times and kept me going. My teammates are my best friends to this day. I have also been very lucky that at different parts of my career I have been mentored or guided by Lynn Jennings, Paula Radcliffe, and Joan Samuelson – three of the all-time greats who all reached out to me at some point in my career and helped me with important choices and decisions. As a professional runner and mom, what is your best advice for women as they balance their running or fitness goals with a demanding schedule and busy family life? It is difficult to be perfect at everything. My advice is to be the best you can at what you are doing at that moment. Don’t worry about running when you are working or with your family. At the same time, don’t stress about family when you are out on your run. Take that time for you. It’s a balancing act, and it’s not always even, but that’s OK. Just do the best you can and remember that no one is perfect. Imagine an ultra with no cutoffs, no sweep vehicle, and no DNFs! This is what you get with fixed-time ultras. According to runningintheusa.com, there are 190 fixed-time races in the United States in 2015, so they are out there, and they are worth a look for those unfamiliar with them. This article might serve as an introduction to this type of race for some of you; others already familiar will, I hope, still find some good information here. I’ve fielded lots of questions in person about this, and of my 90 or so ultras, 44 of them have been fixed-time races from three hours to six days. I managed to set an American record for 48 hours, at the race Three Days at the Fair in Augusta, New Jersey, in 2011, with 257.34 miles, and I nabbed a couple of 24-hour national championships at the NorthCoast 24-Hour Endurance Run in Cleveland in 2009 and 2011. So as a runner who has been said to “specialize in mind-numbing loops”, I suppose I’m something close to an expert. So I’ll start with the basics. You’ll note that I’ll use the word “usually” a lot, to comment on what is most common, while acknowledging that there are always exceptions. 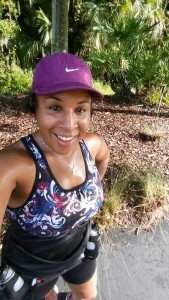 Our guest blogger is Tia Pettygrue, a USATF & RRCA certified running coach. She works with our friends at Florida Road Races. These races along Florida’s west coast were created to promote a healthy lifestyle and showcase their coastal communities. Let’s face it, much of the US has been sweltering recently. Most people would probably rather jump in a pool than run in this kind of weather. But here are some tips to make the most of running in the heat. Know that it will not last. If you’re training during the heat of summer, you’re probably training for a fall race. So chances are, your race may be in the fall when temps will be milder. Don’t expect to run your goal pace. Running in temperatures over 80 degrees (especially in humid areas) can have a 12-20% impact on your pace. So don’t beat yourself up if you struggle to run your goal pace. If you normally run a 10:00 pace and the weather is 85 degrees, your adjusted pace would be around 10:23. So if you’re doing a race and you don’t hit that PR, don’t be too hard on yourself. Dress accordingly. Wear a hat or visor and make sure you put a Sports Sunscreen on before you head out. Wear light colored clothing. I’m jealous of the guys like my husband who can go shirtless when they run. Remember your hydration. Even for a quick 3-mile run, I will wear my hydration belt. I’ll fill my bottles full of ice and then pour water in them. This way, the water stays cooler longer. And, if you’re running at least 45 minutes, add some electrolytes to the water. You need more than ever to hydrate every 15-20 minutes. If you’re running longer than an hour, make sure you have a place on your route to refill if needed. Where I run there is a park every 1 ½ miles with water fountains and restrooms. So look for routes that offer these type of options. Most parks with walking or running trails will have water along the way. Don’t feel guilty about taking walk breaks. It’s hot out there and that sun can zap your energy, so if you need to take a break during your run, take it to refresh and re-energize. Better to take a break than to overheat. Sometimes I’ll incorporate a walk break to take pictures of the beautiful scenery or a sunrise. Become an early bird or a night owl. Find a friend or a group and plan a pre-dawn run or or a run after the sun goes down. Where I live in Florida, it’s very humid even at 5am, but at least the sun beating down. Use caution if running alone – it’s always better if you can have a buddy with you. Heat running will make you stronger. I used to take the summers off from running because of the heat. Then one year, I did a summer marathon up north so I had no choice but to train in the heat. I found I felt more accomplished after each run because it was so hard. When I did the race, it was 45 degrees, and I easily hit my goal pace. So consider heat running a challenge that you can conquer. Stay safe out there! 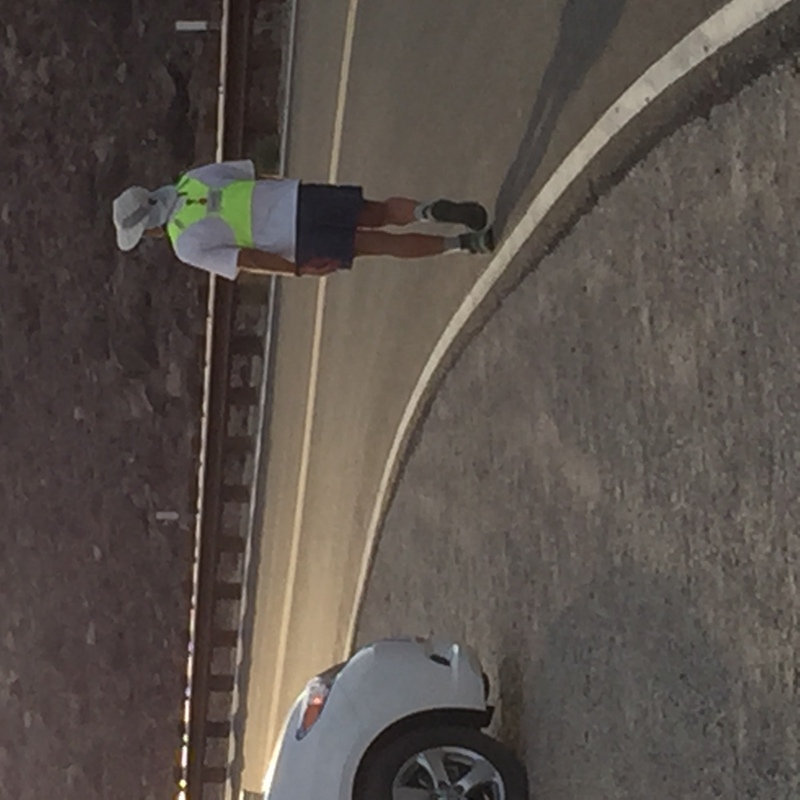 Death Valley National Park, Calif – Crossing the finish line in 42 hours, 30 minutes after running the 135 miles across blazing hot Death Valley was not a record setting time for veteran ultrarunner Marshall Ulrich. A Colorado native, Ulrich is the record four-time winner of the iconic Badwater ultramarathon that starts at the Badwater basin, the lowest elevation in North America at 282 feet below sea level, and officially ends at the 8,360-foot Whitney Portal trailhead on the mountain. 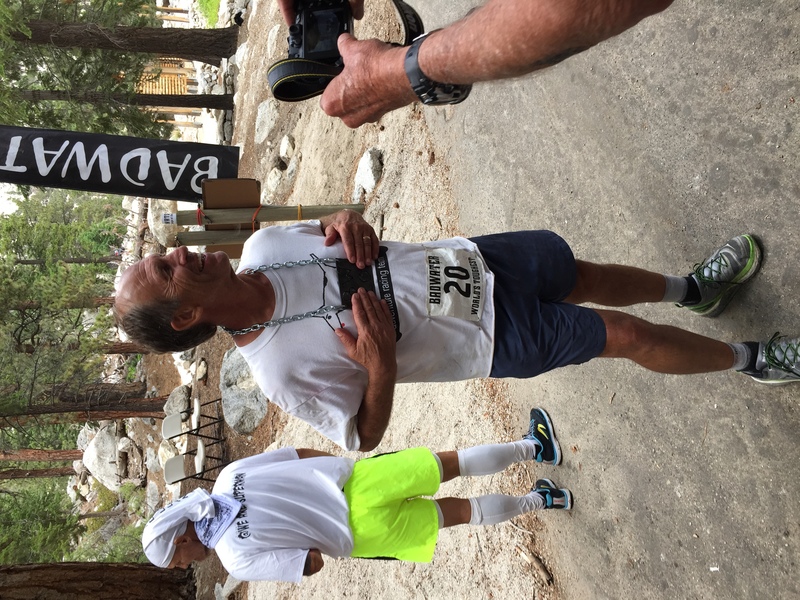 At the 2015 AdventureCORPS Nutrimatix BADWATER® 135 race, Ulrich set another record by completing an unrivaled 20th Badwater 135 races. 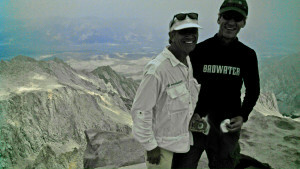 He ran his first Badwater Ultramarathon race in 1990. Left to right: Perry Gray, Marshall Ulrich, Doug Barnette, Dave Heckman. In the field of 68 men and 29 women consisting of extreme sports athletes, adventure racers, ultrarunners, mountaineers, and triathletes who had to compete with their sports credentials and accomplishments just to be invited to the race, Ulrich (64) was a notably competitive applicant. In 2012 Ulrich finished the first-ever circumnavigation on foot of Death Valley National Park, about 425 miles in one of the hottest, driest places on earth, during the most blistering month in U.S. history. He ranked that expedition as tougher than ascending Mount Everest, but not as challenging as his record-setting transcontinental run of more than 3,000 miles from San Francisco to New York City in 52 days, which was the subject of his memoir, Running on Empty. He’s also completed a fully unaided solo crossing and a 586-mile “quad” run across Death Valley. 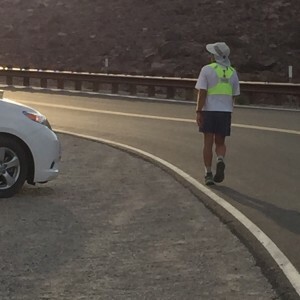 All told, he’s crossed Death Valley on foot, in July or August, a total of 27 times. 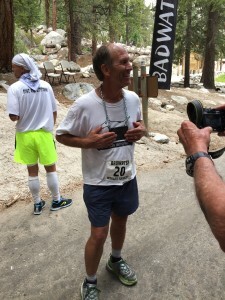 At the 2015 Badwater Ultramarathon, where the average age of the racers was 46 among the 38 newcomers and 59 veterans from around the world, Ulrich placed a solid 63rd of the 97 starters. Eighteen athletes did not finish (DNF) the race. “For various reasons the race went back to an evening, or PM, start which is the way the race run from 1990 to 1995. While some people thought it would be easier, that wasn’t the case. Higher temperatures at the start, as well as sleep deprivation, especially for those of us that had to run through two nights, really took a toll on a lot of participants,” Ulrich theorized. But, Ulrich’s race did not stop at the Portals. For every one of his 20 crossings, Ulrich has completed the 11-mile climb to Mt Whitney’s 14,505-foot summit that is the classic crossing from the lowest to highest points in the continental U.S. This year was no exception. 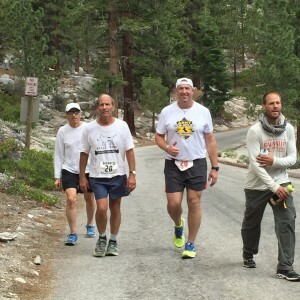 After finishing the Badwater 135, Ulrich obtained the necessary Forest Service wilderness permits and summited Mt Whitney in a total time of 65 hours from his 8 PM race start on July 28th. His record for the 146 miles from the Badwater basin to the summit of Mt Whitney of 33:54, set in 1991, still stands after 24 years. *Photos courtesy of Teresa Reed-Barnette. Marshall Ulrich (b. July 4, 1951) is an elite extreme endurance athlete, as well as an accomplished speaker, author, trainer, and guide. Called the “Endurance King” by Outside magazine, he’s finished over 127 ultra marathons averaging over 125 miles each; climbed to the top of the highest mountain on every continent, including Mount Everest; and completed 12 expedition-length adventure races. At the age of 57, Marshall clocked the third-fastest run across America, about which he wrote his book, “Running on Empty.” A record four-time winner of the Badwater Ultramarathon, Marshall has crossed Death Valley on foot, in July, a record 26 times, including a self-contained, unaided solo, a “quad” of nearly 600 miles, and the first-ever self-supported circumnavigation of Death Valley National Park.